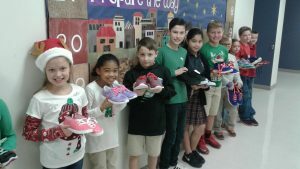 Sole Reason – Donate a new pair of sneakers and change a life. 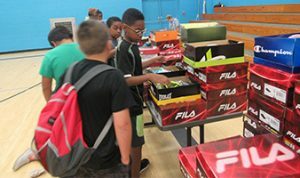 Donate a new pair of sneakers and change a life. ____________________________________________________Wow! GET TEED OFF FOR KIDS. Sole Reason’s mission is to provide every needy child, in the local community, with a new pair of sneakers. 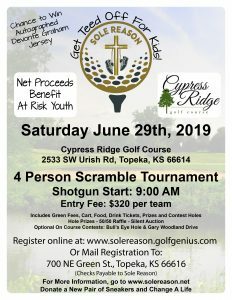 We have set up programs with Boys & Girls Clubs of Topeka, the 501 School District and other organizations to identify needy children in our local area. Sixty-seven percent of families served are at or below the national poverty level. 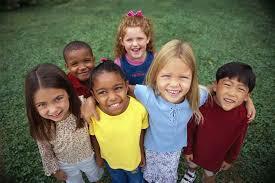 Fifty-four percent of these kids come from single parent households. We want to give these families one less thing to worry about.. Sole Reason in Topeka Kansas, knows the power of one. How do we change the world? We change it with one act of kindness at a time. Please give and let’s change the world…one child at a time. On behalf of the children, God bless and thank you.